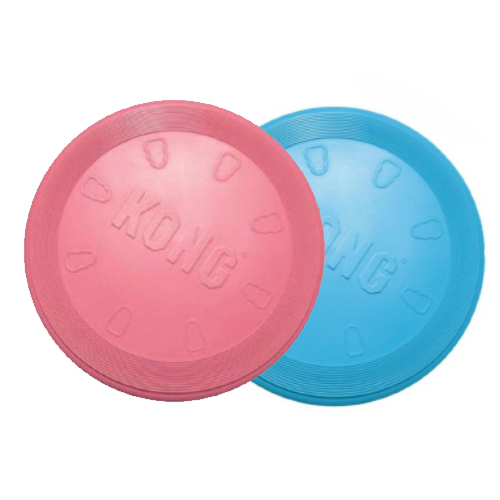 The KONG Puppy Frisbee has been specially designed for puppies. This frisbee is robust and flexible, but soft enough to protect the young dog's emerging teeth. The KONG Puppy Frisbee has been specially designed to meet the needs of puppies. The size of this frisbee is tailored to puppies and the frisbee is strong and flexible. The Puppy Frisbee is made of a special rubber formula, which is soft enough for dogs to catch. This frisbee is ideal for teaching your young dog to fetch. Pink or blue. Please note: this product is delivered at random. You cannot select your preferred colour. Have you used KONG Puppy Flyer Frisbee before? Let us know what you think about this product.